I am still writing. Book II in the British Mystery Book Tours. I am at the final read through before it goes to the wonderful editor at the publishers’. It is amazing how many tiny errors are STILL in the manuscript. Once I get this book off, I will get back to Book II which is in the first draft stage. 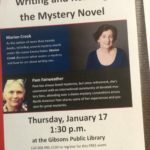 Thursday I join Pam Thompson, an avid reader of mysteries, at a presentation at the local Gibsons’ Public Library. I met Pam in New Orleans at Bouchercon. She only lives a half hour form me but we had to travel all the way to Louisiana to meet.